An okay movie about some less fortunate people living in Louisiana, and the conditions they have to deal with on a daily basis. A movie about a young girl living with her sick father out on a raft of sorts in the flooded wasteland of Louisiana, the setup here is interesting, but the movie lacks any real plot or follow through. This feels like a poetic film, or maybe a documentary about the lifestyle these people lead, but there is a definite lack of story. Only at the end, for a he very first time, do we get the sense that the characters are actually up to something. Beasts of the Southern Wild is not a very good movie. It’s definitely artistic and experimental and all that, but at what cost. In this case, it’s at the expense of a plot. This movie reminds me a little of Tree Of Life, and that’s not exactly good company to be in. Tree of Life was about a thousand times worse, having no real plot at all, and just being a bunch of images and voice-over monologues that really turned out to be lifeless ramblings. 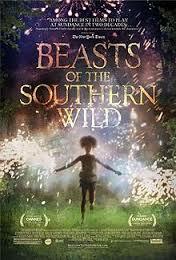 I’m glad to say that Beasts of the Southern Wild is better than that film, but to even be in the same category is a bit of a problem. 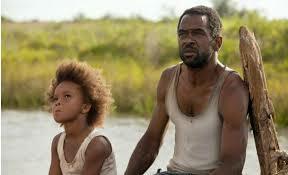 The movie is about a little girl named Hush Puppy who lives in a tiny shanty with her father. At the start of the film she lives in a trailer, but when the father treats her badly, she sets fire to the trailer and blows it up. From that point on, she and her father live in this little abandoned floating construction they put together, out on the river. The movie takes place in Louisiana, just south of New Orleans. It takes place after hurricane Katrina hit, when things were especially bad down there. And the main characters live almost like homeless people. This is a slice of life, and an eye-opening experience, but it’s Lao kind of upsetting. And to make matters worse, there really isn’t much of a plot to the movie. The entire film consists of just watching these characters go along doing things. Like Tree of Life, this movie does use voice-over. That’s a very dangerous thing. Voice-over narration can certainly be used for greatness, (Goodfellas,) but it is also a tool that can easily be abused by movies that don’t have much of a storyline. These movies think they can hide their lack of story by convincing the audience that their movies are poetic or deep, simply because they have the characters giving voice-over narration. It takrs more than that to keep an audience interested. It’s hard to say what this movie is really even about. There are a handful of events or scenes that are memorable, but not so much because of what happens, as much as because of the imagery. There’s a moment, for example, early in the film where everybody is out celebrating with fireworks and Hush Puppy is running around with sparklers in her hands. Cool image, but so what? The fact that this moment is one of the most memorable parts of the film should say something about the movie. Hush Puppy’s father has a condition that makes very ill. When Hush Puppy strikes him on the chest, early on in the film, he falls backwards and goes into a kind of shock. We see strange veins and discolorations on his arms and chest. This guy is in trouble, and not only does he have to find a way to take care of himself, but also his daughter. Now that’s about as far as the plot goes in the first half. Is it interesting? Sure. Is it enough to fill half a movie? Not even close. In the second half of the film, some things finally start to happen. A hurricane refuge camp takes in Hush Puppy and her father and then Hush Puppy goes on a mission of her own. Her mission is to find her mother. Do we get an answer here? This also has the potential to be something interesting and lead to an emotionally rewarding plot. Only the movie doesn’t follow through on it and give us any answers. There is also a storyline about blowing up a dam. This is the climax of the film and the idea is that everyone is trying to keep New Orleans so nice that they are flooding other parts of Louisiana without any care. It is only by blowing up the dam that the people who live south of New Orleans can drain water away from their homes and get their lives back. None of this is really explained, however, and we have to kind of figure it out. That isn’t a very easy task either. On top of all this, there are also lots of images of giant wild boars that look prehistoric, running after Hush Puppy. The boars clearly represent something like the world closing in on her. Beasts of the Southern Wild is not a very good movie. The fact that it is nominated for best picture and best director, when movies like Argo and Zero Dark Thirty didn’t score nods for their directors is ridiculous. Are academy voters just trying to show off how cultured and open-minded they are by picking crap like this? The entire first half really just consists of Hush Puppy and her father sailing around on their boat, which is made out of the back of a pick up truck. In many ways Beasts of the Southern Wild feels more like a documentary about the lifestyle than it does like a feature film. That is definitely in large part due to it’s lack of any real plot.